Dr Bing Hu, Associate Professor in Oral and Dental Health Research at Plymouth University Peninsula Schools of Medicine and Dentistry, has helped national charity Bone Cancer Research Trust to put together new information about ameloblastoma, a rare non-cancerous tumour arising in and around the jaw bone. Only one per cent of all jaw tumours are ameloblastomas, and they are benign tumours which involve excess tissue growth in and around the jaw which can appear to be solid or cyst-like. It is common for the tumour to develop around the position of the wisdom tooth with most occurring in the lower jaw bone. Ameloblastomas grow slowly and are non-cancerous, but occasionally they can affect tissues surrounding the jaw area, including sinuses and eye sockets. They can also cause bone destruction and some facial distortion. Ameloblastomas affect men and women equally and can affect any ethnic group or age group, although it is most common in those around 30 to 40 years of age. It is relatively uncommon in children under the age of 10. The most effective treatment for ameloblastomas is the surgical removal of the tumour using what is called ‘wide surgical margins’. 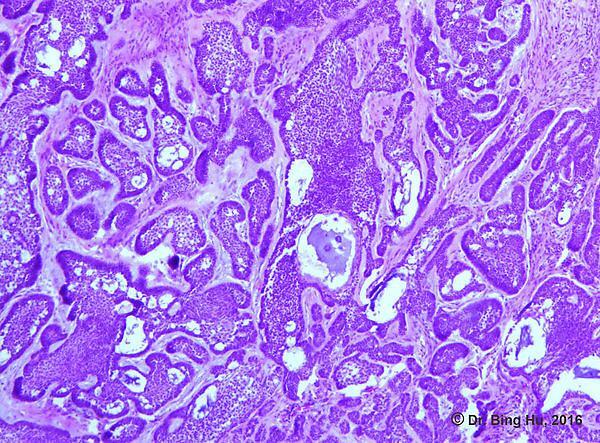 In this instance, healthy tissue is removed alongside the tumour to ensure that all tumour cells are removed in order to reduce the risk of the tumour returning. On rare occasions surgeons may need remove part of the lower jaw. Patients will then undergo surgical reconstruction, with either a metal implant or an autograft. An autograft is a graft which uses bone taken from elsewhere in the body to reconstruct the jaw after tumour-removal surgery.